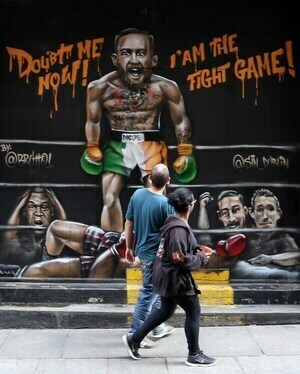 Posted in Misc and tagged Conor McGregor at 10:45 am on March 26, 2019 by Bodger. Getting out before the charges are brought. Probably packing up to move to a no extradition country as we speak. Fully agree – apparently the medical report was horrific. He’s going to start a new career painting deformed wall murals. Watch out @BR<~w@NK !!! Now who’s gonna represent us on a world stage?????? He’ll probably be standing for election in a couple of years like that other boozy boxer/fighter fella. Or Lord Mayor. We’re an awful country for celebrating thugs, liars n’ cheats. This ploy doesn’t work twice connor. just a tip, frillz – I don’t think the hurling talk is turning rotide on. you’re barking up the wrong tree. try bakery or caravanning. Help remind everyone that all that lark was axed? BB is right, I’m lost. Is this a Shefflin thing? Does this mean that he’s going to shut his mouth for good? He needs to make the money while he’s still…ehhh…at liberty to do so. Athletic careers are short. Yeah, that $100 Million he earned for the Mayweather circus will barely see him through the year. Bankrupt in 5 years…will then be doing showcase boxing matches to raise funds…or even a wrestling match like Mohammad Ali….this is far from the last we have heard from him…unfortunately. Banged up in 5 years…hopefully. Do ye remember a post from me last October talking about how spoilt votes get treated by the returning officers at a count? But dustin would have a made a much better president than either! Your definition of “Everyday Person” must be similar to the Sid Vicious view of “the man on the street”. What’s an everyday person anyway? Aren’t we all people every day? He does not appeal to the everyday person though, he appeals to the lowest common denominator. 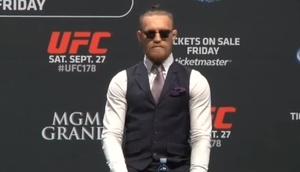 The IRA made you cross eyed, dude. I’d hate to correct McGregor, but MMA is not formally known as Mixed Martial Art . NY Times have printed it now…. As has the Guardian referring the NYT article.